If you are looking for a neutral bounce house , and a nice birthday graphic... This is it!!! 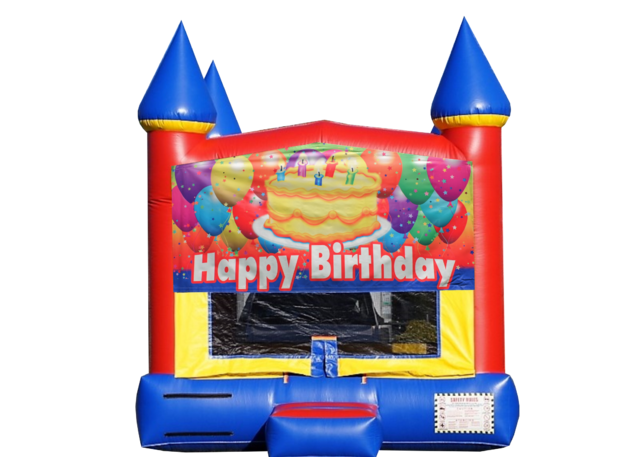 This inflatable bounce house it's made in bright colors and can match almost every party theme... Our happy birthday bounce house is one of our most popular bounce house rentals. You can easily match this bounce house with any of our interactive games, inflatable slides or obstacle courses. We also have chair and table packages, cotton candy machine rentals and snow cone machine rentals in inventory. Want to see a video of this classic bounce house?